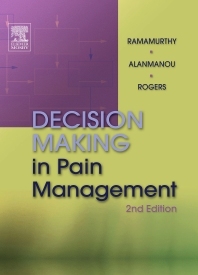 Clear algorithms and concise accompanying explanations facilitate the evaluation and management of nearly 140 common pain manage¬ment problems. The New Edition of this best-selling resource features a completely new section on Cancer Pain plus brand-new chapters on patient evaluation, chronic pain, upper and lower extremity pain, nerve blocks, and more. It also incorporates comprehensive updates throughout to reflect the latest evaluation techniques, treatment approaches, and pain syndromes. Offers an entirely new section on Cancer Pain, plus brand-new chapters on patient evaluation, chronic pain, upper and lower extremity pain, nerve blocks, and more. Reflects all of the latest evaluation techniques, treatment approaches, and pain syndromes. 47. Medical Management of Cancer Pain: Oral Analgesics?